Here’s an article from this month’s NZ Baptist magazine. A refugee camp seems an odd place for a spiritual retreat. Is a place where food is scarce, people are forbidden jobs, banned from travel, suffering the physical and mental scars of decades of strife against a brutal and unrestrained military dictatorship somewhere to refresh the soul? It may not seem obvious, but that is what we did. We must admit, some aspects of life in Mae La are not conducive to spiritual renewal: The toilets double as “shower” rooms but have mud floors. We are not used to sleeping through noise, so band practice starting at 5AM, with choir finishing at 9:30PM, followed by chatting and even mobile phones till late into the night just through the partition next to our sleeping mat, left us tired! Yet our four weeks in the Mae La camp were part of Tim’s sabbatical from teaching at Carey, and “leave of absence” from work as a family therapist for Barbara, and a Big(ger than usual) OE for Sarah (a University student). It is not as daft as it sounds, we learned in Africa that often people who have the least can teach the most about relating to God – Kiwi Christians often look embarrassed giving thanks for a restaurant meal, African Christians will naturally pray over a glass of cool clear water. 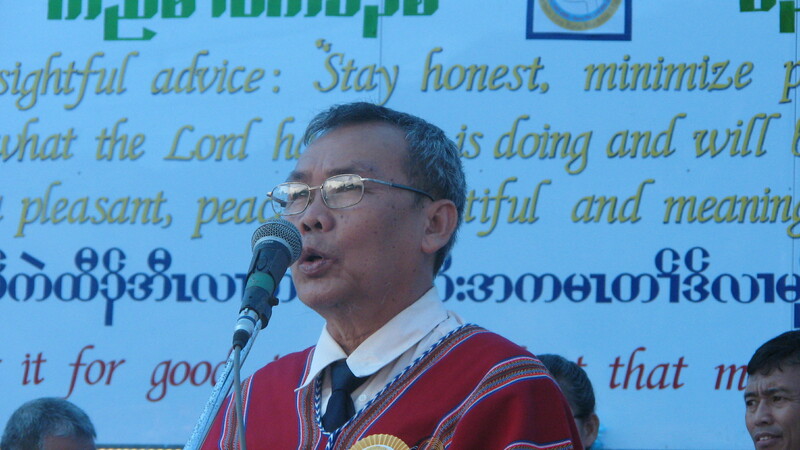 Pastor Dr Simon Htoo principal of KKBBSC at the Jubilee. Pastor Simon was the second ever winner of the BWA Human Rights Award after President Jimmy Carter. Karen refugees certainly don’t have much: a roof over their heads – usually made of leaves since “permanent” materials like corrugated iron are forbidden, some food – because refugees can’t work officially, rice and some fish-paste is provided for each registered refugee family (naturally it’s shared with those who are not yet registered), and safety in Thailand – the army of the Myanmar Government won’t burn their homes down or “recruit” their young men as porters and work them to death here… but they do have faith, hope and love. Many Karen are Baptists, and have been for nearly 200 years, Christianity is deep-rooted here. We visited a village of IDPs (Internally Displaced People) whose village was burned following an army raid. They had rebuilt not only homes, and a temporary church, but a school that attracts children from villages in Burma and from the refugee camps – all with no help from any government, and only a bit of help from NGOs: one charity gave materials for permanent classrooms another feeds the children with rice everyday, vegetables and fish-paste twice weekly, and meat once a month. We were at the village to celebrate their new permanent church building, with tiles and a bright blue roof. The singing lasted hours, as you can imagine it was a time of great joy. We went to Mae La to teach (Tim – Old Testament Narratives, Barbara – Human Development, Sarah – English) and to share in the jubilee. The Kawthoolei Karen Baptist Bible School & College was founded 25 years ago in Burma, but 18 years ago moved to Mae La, when the army burned down the school and the village around it. Today, some students were born as refugees, but others have crossed the border recently and do not know the fate of the rest of their family. The refugees we met are Christian and their faith is in Jesus (who else can a refugee trust? 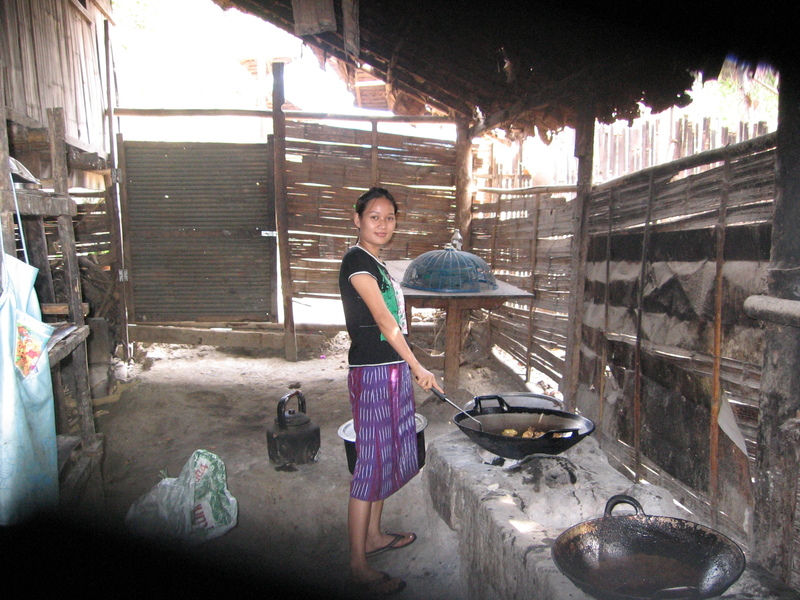 ), their hope is in God (humans have tormented them and let them down – they used to hope that Westerners would help against the military dictators, but after years of waiting that hope is less strong now) and their love comes, not only from Karen tradition, but also from the Holy Spirit working in them. After all, maybe a refugee camp is a good place for spiritual renewal! There’s a popular quote about tourists leaving only footprints and taking only photos. It makes some sense, but it misses the real point of travel. When you go elsewhere and live among a different people you are changed. If you are not then you have failed to really be there no matter how long you stayed! So, when we visited the refugee camp at Mae La though we went as teachers it was inevitable we’d learn more than we could teach.